STRADE initially concentrates on the industry perspective. Based on an analysis of the European mineral raw-material mining sector’s competitiveness, the objective is to provide a strategy on how the EU can strengthen mining investment into and within the EU. Areas in which there is a need to revisit and improve present policies and conditions to advance European competitiveness for inward investments are identified. See a more detailed description under “Strengthening”. STRADE also addresses equipment and service suppliers, exploration companies and investors. EU-level dialogues are initiated with mineral-producing countries to support European businesses in these sectors within non-EU countries. These activities also serve as a gateway to future cooperation between the EU and other raw-material-producing countries and often address environmental challenges in the mining sector. See a more detailed description under “Cooperation”. Subsequently, STRADE focuses on the governmental level and the EU’s relation to mineral-producing countries. 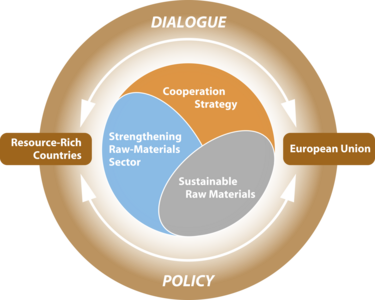 Based on a mapping of present EU and member-state engagements as well as those engagements of non-EU countries, the project provides analyses on how the EU can renew its engagement with mineral-producing countries aiming at a larger EU strategy to ensure fair and unrestricted access to mineral raw materials worldwide. Specifically aiming towards improving environmental and social sustainability, new concepts are developed for Europe’s role in international actions toward sustainable mining and processing. Stakeholder workshops are held addressing possible contributions from EU Member States to several objectives, including an international resource governance alliance, internationally accepted sustainability evaluations and other certification schemes. See a more detailed description under “Sustainability”. Providing scientific assistance and insight for the project, a STRADE Advisory Board of renowned experts from raw materials governance meets annually and contributes to the publication review process. Communications and dissemination are core elements of STRADE. In addition to writing the many policy briefs, presentations and reports, STRADE members will be active in www.goxi.org, a forum for exchange about raw materials. Please feel free to join the dialogue. This project has received funding from the European Union’s Horizon 2020 research and innovation programme under grant agreement No 689364.